Hip pain from arthritis, bursitis or a strained muscle can slow you down considerably. Your hips are one of the largest joints in your body and support your entire body weight as you walk. Swimming is an ideal exercise for those with hip pain, as the water can be soothing. 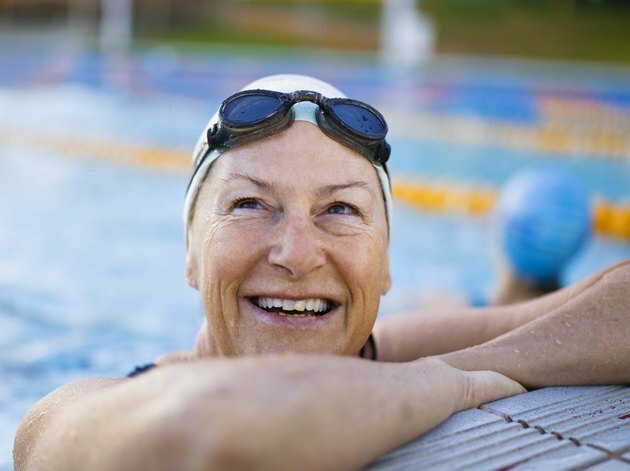 When your hip pain recedes, combine swimming with a weight-bearing activity, such as walking or jogging, to reduce your risk of osteoporosis. Treat your hip pain as directed by your doctor or physical therapist before beginning to swim. If you exercise too soon after an injury, you risk harming the joint even more. Treatment includes icing the hip, taking anti-inflammatory medications, and performing stretching and strengthening exercises for rehabilitation. Warm up in the water with walking or gentle stretching before you swim. The buoyancy of the pool is easy on your joints and helps you loosen your hip more easily than on land. Hip stretches can include pulling your knee up to your chest and standing in a "figure four" position. Supporting yourself on the pool wall, place the sole of your foot flat on your other thigh. Swim the freestyle, or crawl stroke when you have conditions that cause hip pain. The flutter kick, performed by moving your feet up and down, does not put stress or strain on your hips. Breaststroke and sidestroke kicks are more likely to exacerbate hip pain. Choose the backstroke once you have mastered the crawl without hip pain. The backstroke kick is like an inverted flutter kick. The backstroke might be more difficult to perform with hip pain; remaining on your back requires a tightening of your core muscles, which can cause you to strain your hip. UptoDate; "Hip Pain"; Bruce Anderson; September 2010.